I had visited this site back in June, 2007 and catalogued it as a winter camping possibility based on several camping areas, ease of access, and a superior ham radio location because of the “antenna support structure”, errr…. Firetower on the edge of an 1000’ escarpment facing southwest and overlooking the Woodstock Catskills valleys. You can see some site pictures at: http://www.firelookout.net/Individ_Lookouts/US223_Overlook_Mtn.htm . So my winter hiking friend, Joel W2TQ and I set out from the Overlook Mtn parking area around noon, Jan. 18th. Although sunny and blue-sky clear, the temps were in the low 20’s with forecasted near O f. overnight temps. The last snowfall was a week or so ago and the trail was snow packed and icy in spots. I had my Kahtoolas but did not bring the snowshoes. The 2.5 mile hike and 1,500 foot elevation gain to the top was beautiful, passing the skeleton of the Old Overlook Mountain House (http://www.hudsonvalleyruins.org/yasinsac/overlook/overlook.html) at the two mile mark. This link has some great pictures of this magnificent hotel. A short time later, we were at the Overlook Firetower, a 60’ Aeromoter steel cabin structure. The winds were out of the northwest at 10-15 mph but harsh on any exposed skin. We set up camp about 200 yds east of the tower near the Overlook escarpment to the east that provided great vistas of Kingston NY and the Hudson River valley. After getting my tent up in the 6” of snow, I went up to the tower to hang my multiband dipole from the 60’ level to the 20’ top of a nearby tree. The dipole center was at about 35’ and oriented southwest-northeast. The tower is perched on an escarpment that drops 750 to 1000 feet to the south and overlooks the nearby town of Woodstock, NY. So the HAAT couldn’t be better for my QRP K1 signal to the southwest. However by 4 pm the temps were in the teens and the wind was still gusting to 20 mph, making the windchills “challenging!” I was setup on a picnic table and bundled up with all my clothes to stay warm. Operating my HandiKey with gloves on is a skill I haven’t quite mastered yet, but I mustered several good qsos and always to the amazement of those in 70-deg shacks. “You’re doing what?” “You must be crazy!” are typical comments but always offering encouragement of “keep warm” and thanks for the field efforts. Sunset was near and I packed up the K1 but left the antenna in place as I wanted to operate again in the morning. Without any protection from the now-steady 20 mph winds and temps dropping into the mid-teens, it was just too difficult to stay warm and continue to operate. I went back to camp and took a number of pictures of the sunset. Joel is a much more dedicated photographer and had his Canon Digital SLR setup on a tripod to record the sunset panorama unfolding to the west. By 5:30 it was dark and dinner preparation began. Heat! And my cold hands enjoyed the trace warmth from my MSR gas stove. Freeze-dried Turkey Tettracini was on the evening menu…yuummmm! I recently discovered the value of heating your extra water, storing it in your cozie-wrapped water bottle and putting it at the bottom of your sleeping bag as a footwarmer. What joy! And it stays warm all night long. It’s surprising what an impact warm feet can have on your overall camping experience! One other challenge with winter camping is that it is dark by 5pm, dinner by 6pm and then what? So you stand around in the cold talking until 8 pm then out of boredom you crawl into the bag for warmth. It’s probably the only time I get 10 hrs of sleep! Overnite temps were down to nearly 5f. 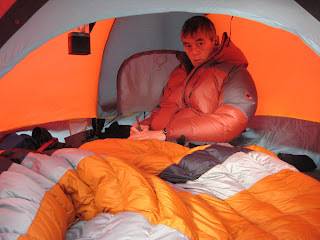 So it was cold but the tent stayed much warmer than I expected…in the high teens! I was up at 7 am to see the sunrise but unfortunately low-level clouds obscured the eastern light show this morning. With occasional snow flakes, we cooked breakfast. My breakfast menu choices were gourmet oatmeal seasoned with brown sugar and hot tea. Can it get any better than oatmeal and tea? I packed up everything and then went up to the firetower to operate Saturday morning. Fast moving clouds occasionally obscured the sun coupled with the single-digit temps and the 10 mph winds that cut into any exposed skin. I pulled the K1 out for duty (always amazed how well it operates in these temperatures!) and made a few qsos with folks in the midwest and southeast. After an hour I was too cold to continue so packed up the antenna and gear to start the trip back to the pickup. It was Saturday morning so we were seeing a number of folks on the trail who were out for a quick morning dayhike. What fun! And we were already planning our next winter camping trip in mid February. Hopefully it will snow this time! And I already have ideas for adapting a winter sled (“pulk”) to take the winter pack off my back! So the adventures and of course the stories continue…. It was about noon on Friday, Jan 4th when my new Garmin Nuvi GPS flawlessly guided me into the Appalachian Mohican Outdoor Center (MOC) (http://www.outdoors.org/lodging/lodges/mohican/index.cfm ) in west New Jersey. The Appalachian Trail crosses about 1/4-mile from the MOC lodge, a very busy place during the summer hiking season both with local day hikers as well as the AT thru-hikers. Joel, W2TQ and I met up with Ed, WA3WSJ, Glen, NK1N, and the other early arrivals at our cabin "Blueberry Hill" for our 3rd annual January Polar Bear outing. The weather was uneventful (as opposed to previous years) with warm temperatures and clear skies forecasted for this weekend. 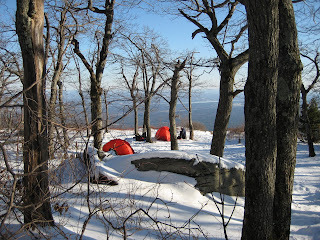 Joel and I intended to hike up to Catfish FireTower ( http://www.thebackpacker.com/pictures/album/ryebhgg0.php ) on the Kittatinny ridge about 500 elevation feet above the MOC and spend the night as part of a winter camping shakedown of tents and equipment. Although not as cold as our previous Mt. Everett, MA effort the first of December (http://n7un.blogspot.com ), overnight temps were in the low 20’s but generally clear skies and the afternoon breezes died down after sunset. I additionally intended to hang my multi-band dipole (40, 30, 20 ) off the 60’ antenna support structure, errr.. firetower for some 40m QRP fun with my Elecraft K1. My goal was to operate Friday evening and Saturday morning. The AT follows the Kittatinny Ridge in west New Jersey for about 40 miles. And Catfish is one of two 60' firetowers in this section. This is a great location because the terrain both east and west drops off over 500' very rapidly thereby significantly enhancing any RF QRP signal. We left Blueberry Hill cabin about 1:30 pm and the 1.5 mile hike up to Catfish was easy in spite of our heavy packs, full of cold weather gear, extra water, stoves, and large tents. With only a breeze up top, tent setup was uneventful. Joel wasn't going to operate so I garnered the best tent location near the tower. I climbed the 60' tower and hung one end of my 40m dipole at the 60' level and the other end over the top of some 20' elm trees with the 35' of coax directly over my tent. The dipole broadside was NW-SE, optimum for any midwest contacts. We were ready to go and I quickly setup the K1. It's always a rush when you first power up the rig and hear the band hopping with activity. It was going to be really fun operating from such a great location and the winter weather couldn't be more cooperative. Sunset was at 5 pm and the temperature was dropping fast. Forecasted overnight lows were in the mid-teens although current readings were in the high 20's. I was on the air at 5:15 and had a number of quick qso's before striking Polar Bear gold with a fun QSO with Steve, N0TU, in Coloradio. Always a treat to share a GRRRRRRRR with our Bears out west! I worked a few more folks that evening before taking a break to fix dinner. It wasn't until after 8 pm that I got back to 40m but the band was really long and the QRN challenging. Sunrise was around 7 am and I awoke to a brilliant cherry red sky to the east. Temperatures were in the low 20s with no wind so the morning looked very promising. A quick CQ bagged NK1N who was up a bit early in order to start breakfast for the in-the-lodge-den Bears and then a surprise with a long 57N qso with CM2AF in Havana who gave me a 55N...not a bad way to start the QRP morning! After a quick gourmet oatmeal breakfast, I was back on the radio for a bunch of QSOs including a number of Polar Bears. Over all I had 28 QSOs including 7 Polar Bears (N0TU, WA3WSJ, NK1N, WB3AAL, WA8REI, AB4PP, and AB0SR). More information about the Polar Bear Club can be found at (http://www.polarbearqrp.org ). Thanks to all the Polar Bear's who were out on the hunt. It's always fun to share a few GRRRRRs! It was now around 10 am and we had a few visitors hiking into the area. Temperatures were climbing fast into the low 40's and now sunny. Almost T-shirt weather! 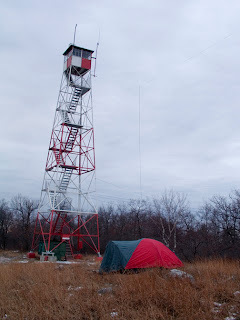 Four of the MOC Bears hiked up to the Firetower around 11am to visit and also operated QRP portable on the ridge adjacent to the Firetower for a couple of hours. Joel and I broke camp about 1 pm and met the rest of the guys on our way back down to the lodge. We had a fun but uneventful overnight on the Ridge but the prospect of a warm shower and the comfort of the lodge was very appealing, like the reward of an ice cream cone after a hard day's work in the summer. So the stories were fairly mundane but sometimes that's just the way it is. There will be many more opportunities for Mother Nature to balance the scorecard. Thanks to everyone who gave us a Polar Bear contact!